In today's world, smartphone are becoming vital part of our lives. They are being used to perform our daily routine tasks like checking emails of the company etc. They are also used to entertain ourselves by watching videos on these smartphones. By the use of large screen smartphones, the web surfing becomes more convenient for the users. The data plans offered by different cellular companies are limited for users to use. In this article, I will discuss some ways through which you can easily reduce the data consumption in your android device so that you can enjoy stream less and unstoppable 3G and 4G data plan. In android, you can get the benefit of the built-in feature or tool added in the OS for tracking the data usage of your smartphone. You can easily find that tool from Settings menu. In Settings Menu, you will see menu named as Data Usage from which you can have all the stats about your apps usage of data. You can manipulate settings according to your needs. You can restrict any application which you think is un-necessary of irrelevant for data usage. Through this step, you can easily manage the data usage and can restrict the usage up to some extent. The second way to limit the usage of data in your smartphone is to reduce your usage in browser. The most used and favorite browser in android operating system is Google Chrome. There are some settings in Chrome, which you can tweak in order to limit your data usage. In Settings menu of Chrome, you can go to Bandwidth Management area. In this menu, you can turn on Reduce Data Usage option which will be used to compress all the data before downloading it to your device. If you dislike Google Chrome browser due to any reason and want to use Opera Mini, then you can also avail such restricted data usage option in Opera Mini too. The default functionality of Opera Mini includes the compression of data. It is another best browser which is pretty fast and light weight that can limit your data usage up to some level. Opera Mini can compress your data up to 90 percent. 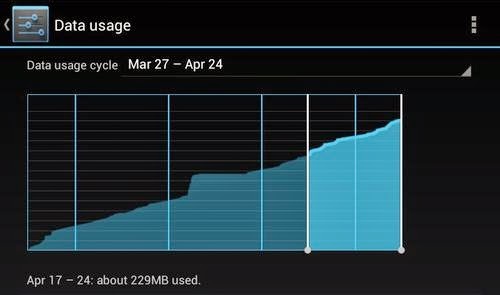 The statistics of the data usage can be accessed by going to Help section in Opera Mini. If you don’t use internet only for browsing and love to download stuff from internet, then in this case you will need any media compression tools. There are two tools which can be used for this purpose which are Opera Max and Onavo Extend. After creating VPN connection in any of these tools, the videos and photos of twitter and Instagram will be compressed. So, these are some of the best, effective and easy ways to reduce your data usage in smartphone. If you are a browser instead of downloader, then you can use Data Compression tools. If you are a downloader instead of browser, then you can use Media compression tools. If you know any other effective and easy tips for reducing the data consumption in android device, then let us know by commenting below.